Do you need a website, but don't know where to go? Have one, but hate it? NJAccess creates custom creative that will accurately reflect the quality of service your business provides. Harness the power of the Internet to generate high quality leads. 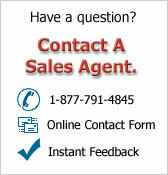 The right web site will generate quality leads and enhance your marketing efforts. We make it easy and affordable. 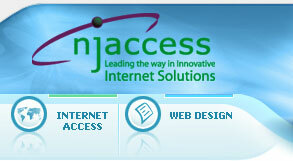 NJ Internet Access is a complete web service company. We develop, build, host, and maintain your website with the goal of reaching customers. 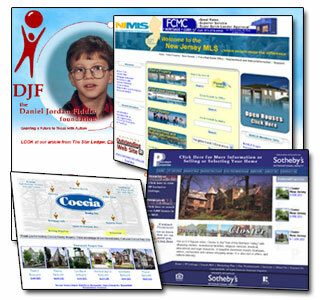 NJ Internet Access uses the latest creativity and design tools available. With over 15 years of experience NJ Internet Access has been creating cutting edge front end design solutions for our clients. We make the websites that will leave your competitors envious. From the internet, to multimedia projects, let NJ Internet Access create a effective solution for you, and your company. Process: The graphic design and overall feel of your site are what make a first impression. The artistic presentation, site architecture, and overall aesthetic quality of your web site are among the most critical factors. Our design team understands that your success online is dependent on our ability to know. Alliances: We believe that in order to truly provide you with cutting edge technology and eye catching creative content, we need to align ourselves with a wide complement of strategic companies. Maintain: At NJAccess we believe that marketing and maintaining your web site serves not only to promote but also to protect your online investment. Our websites are designed with three key factors in mind. The site must have a clean layout. It should also be easy to navigate. Finally, it must be intuitive. One purpose of your website is to convey your message. A presentation will be able to convey groups of messages. Your presentation will use the basic elements of an effective presentation sound, text, graphics, and animation. We can also create your presentation in a wide variety of languages. NJ Internet Access is not limited to the internet and presentations alone. We can also help create an effective solution for television and store kiosks. A website alone will not help you grow your business. An effective marketing campaign can expose your website to many new potential customers. Let the creative minds of NJ Internet Access develop your new stimulating image. NJAccess has prepared a downloadable Design Request Form to help you plan your project. Completing it before you contact us will set your site on the best possible footing, whether you work with us or take the job elsewhere. The New Jersey MLS was founded in 1977 when the Internet was only a simple notion on someones desk. 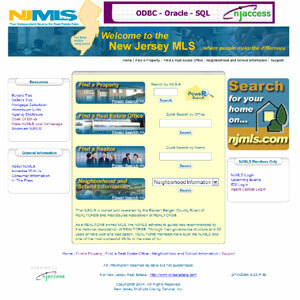 The NJMLS now has a broad range of eBusiness solutions including a scalable IDX solution for their members. Through our eMarketing plans they are also well positioned in the Internet search market, getting well over 300,000 visitors each month looking for Real Estate in New Jersey. Are you interested in e-commerce? Do you have existing artwork or photos? Anything, such as shopping carts, flash, forums, custom programming, that you will need to include on the site? List the web address, (URL), of any existing website that you feel will give us an idea of how you want your website to look and function. What is the budget range for your web site?